The Data Catalog is a publicly available tool that does not require an AKN account. 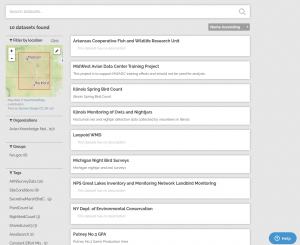 The Catalog provides summary information about all of the datasets that are currently curated in AKN systems (with the exception of E-bird and Breeding Birds Survey). Data owner contact information is listed in the summary under “Author” to allow user to contact data owners, if desired. Data summaries include several pieces of information including geospatial information, species lists, number of species, number or records, survey type, data sharing level(s) and more. Survey datasets that contain publicly available (Level 5) data include a link to the Data Downloader for that project, to allow user to download any publicly available data. You can search and review the data catalog here. For a short web tutorial on the Data Catalog, visit the Data Catalog video tutorial. 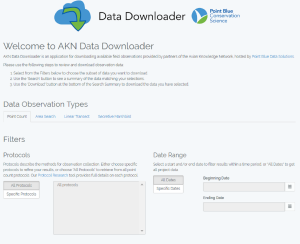 The AKN offers this application specifically for downloading observations that the owners of data in the AKN have made publicly available (AKN Sharing Level 5). The downloads provided through the Data Downloader are meant to be used in cross project comparisons and studies. The data is simplified to the common fields for each survey type and does not include project specific data that may have been collected. Each row in a download includes a catalog identifier indicating what dataset that row came from. The application allows users to select and download large datasets using several optional filters including protocol type, beginning and ending date, species and guild, region type (USNABCI BCRs, LCC, US State boundaries, etc), and Project Names. Data owners or users that have been given access to a dataset by a Project Leader may also use the Data Downloader to download that data. In this case, downloaded data will include all dataset fields. To use the Data Downloader, you must first register for a user account by filling out the online user registration form. Users that already have an account can access the Data Downloader here. For a short web tutorial on the Data Downloader, visit the Data Downloader video tutorial.